Burnley's Sam Vokes celebrates scoring his side's second goal of the game during the Premier League match at the Cardiff City Stadium. PRESS ASSOCIATION Photo. Picture date: Sunday September 30, 2018. See PA story SOCCER Cardiff. Photo credit should read: Nick Potts/PA Wire. RESTRICTIONS: EDITORIAL USE ONLY No use with unauthorised audio, video, data, fixture lists, club/league logos or "live" services. Online in-match use limited to 120 images, no video emulation. No use in betting, games or single club/league/player publications. Striker Sam Vokes is confident that the Clarets have turned a corner after securing back-to-back wins for the first time since April. 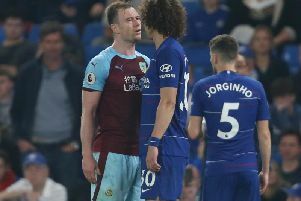 The Clarets had beaten both Watford and Leicester City then at the back end of a five-game winning stretch which ultimately consolidated seventh spot in the Premier League. The latest triumph against the Bluebirds at the Cardiff City Stadium, following on from victory over AFC Bournemouth, pushed Sean Dyche’s side in to mid-table, five points clear of the bottom three. “It’s a huge three points for us,” said the Welshman. “It was a tough game, there weren’t many chances in it for us, we had to dig in and when we got the chances we had to take them. “We had a chat at half-time and when we came back out it was important to put our foot on the ball and start playing and work in behind a bit more. He added: “I think we’ve turned a corner. It was a tough start with Europe and the amount of fixtures we had. “It was huge for us to get those two wins on the board and with Huddersfield at home next week we’ll be looking to add to that. “We had a chat before the Bournemouth game and it was important we got the performances from last year back. Vokes netted the winner in South Wales to mark his 100th appearance in the top flight. All but 11 of them have been with Burnley – with the remainder belonging to Wolves – and he feels that achievement represents the growth of the club. “I found that out before the game, it’s nice to tick that off,” Vokes said. “It’s good to be part of that, most of that was with Burnley so it shows how far we’ve come. “The first year I was here we were battling for survival in the Championship. To see the growth we’ve had to be in the Europa League at the start of this year is massive. He added: “It’s always nice to score. It was a tough game today, when they equalised the crowd got behind them and you felt the momentum was with them.